Sewing a laptop case can seem overwhelming with all the layers needed to give it the cushion it requires. This bag pattern squashes that obstacle with the use of quilted fabric. The padded fabric eliminates the need to add batting and works up very quickly. If recycling is more your style, use an old cutter quilt. This way, you can reward yourself with a usable keepsake from the original owner of the much-loved bed covering. Throughout the entire pattern, 1/4-inch seam allowances are used for basting and 1/2-inch seam allowances are used for constructing the laptop case with one exception. 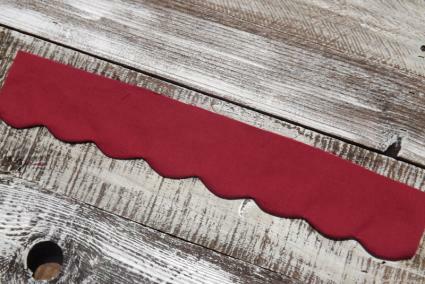 The scalloped edge of the collars are sewn using a 1/4-inch seam allowance. Trim all construction seams to 1/8 inch to eliminate bulk. Print the pattern for the laptop case (right). The printable includes actual-size patterns and pattern dimensions. If you have trouble printing the pattern, try these helpful tips. Cut the laptop case pieces. From the quilted fabric cut two bodies, one pocket, one flap, one shoulder strap and two handles. From the lining cut two bodies, one pocket lining, one flap, four scalloped collars, one shoulder strap and two handles. 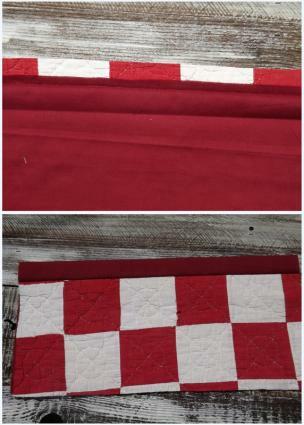 Lay the quilted pocket on your work surface with the right side facing up. The long edges are the top and bottom. Place the pocket lining on top of the pocket with the right side facing down. Shift the top edge of the lining down 1 1/2 inches and pin. Sew the pinned edge using a 1/2-inch seam allowance. Fold the lining to the back of the pocket. Line up the edges and press. Baste the sides and bottom of the pocket using a 1/4-inch seam allowance. Trace the flower pattern twice on the paper side of lightweight fusible web. Cut out the flower shapes. 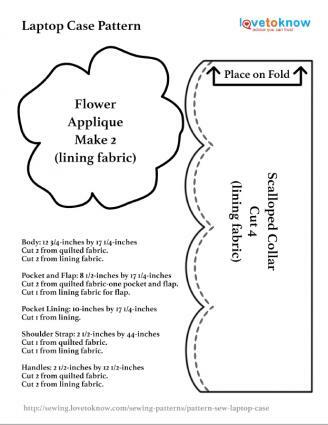 Place the flowers with the glue side facing down on the wrong side of the lining fabric. Iron the flowers to fuse them to the fabric. Cut out the fused flower shapes. Peel the paper backing from the fused flowers. Place the flowers side-by-side on the pocket with the glue side down. Position them 3/4 inch below the top pocket cuff and separate them by 3 1/2 inches. Iron the flowers to fuse them to the pocket. Using matching thread, sew a zigzag stitch around the edges to applique. 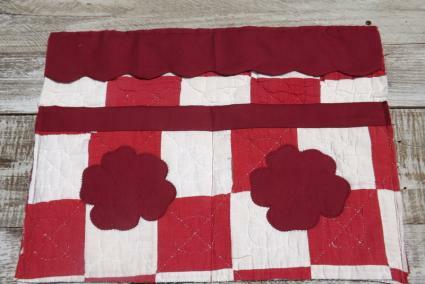 Lay one quilted body on your work surface with the right side facing up. This will be the front of the body. The long edges are the top and bottom edges. Place the pocket on the body with the right side facing up. Match the side edges and the bottom edge of the pocket to the edges of the body and pin. Baste the pinned edges. Top stitch from the top-center of the pocket to the bottom-center. This creates two smaller pockets for tucking away cords, chargers and other small accessories. Place two scalloped collars together with the wrong sides facing out. Pin the scalloped edge only. Sew the pinned edge using a 1/4-inch allowance for the seam. Trim the seam to 1/8 inch and clip the valleys. Turn the collars right side out and press. Lay one collar along the top edge of the body front with the raw edges of the collar lined up with the body-top and the side edges. Baste the raw edges to the body. Baste the remaining collar to the top of the body back. Place the two body pieces together with the wrong sides facing out. Pin the sides and bottom edge. Sew the pinned edge using a 1/2-inch seam allowance. Trim the seam to 1/8 inch. Sew the body lining in the same way, leaving a 5-inch opening in the bottom seam for turning. Sew boxed bottoms. Cut out a 1-inch square (inside the seam line) from each bottom corner of the case's body. Open one corner. Match the side seam with the bottom seam and pin the edge together. Sew the seam using a 1/2-inch seam allowance. Trim the seam to 1/8 inch. Repeat on the other bottom corner and the bottom corners of the lining bag. Pin the quilted shoulder strap and the strap lining together with the wrong sides facing out. Sew the long edges using a 1/2-inch seam allowance. Trim the seams to 1/8 inch. Turn the strap right side out and press. Sew the handles in the same way. 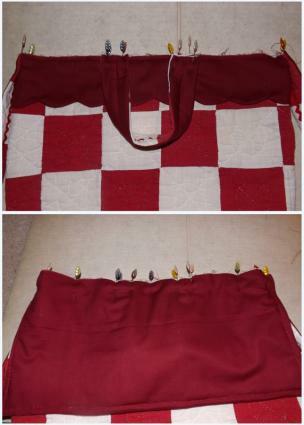 Using matching thread, sew rick rack down the center of each handle and the strap. Turn the quilted body right side out. 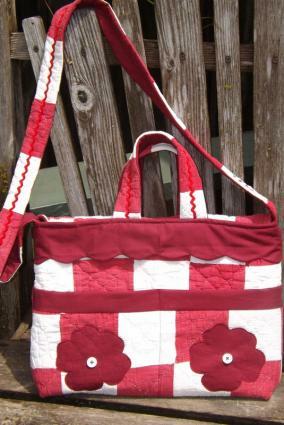 With the quilted side facing down, pin the ends of the shoulder strap to the top of the bag, over the side seams. Center one handle on the front and back at the top of the bag. Separate the ends by 2 1/4 inches and pin. Baste the handle ends. 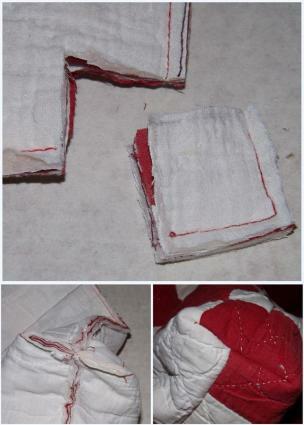 Place the quilted flap and the flap lining together with the wrong sides facing out. Pin the short ends and one long edge. Sew the pinned edge using a 1/2-inch seam allowance. Trim the seam to 1/8 inch. Turn the flap right side out and press. Top stitch sewn sides 1/4 inch from the edge. Lay the case on your work surface with the back facing up. Line up the raw edge of the flap along the top of the bag with the wrong side of the flap facing up. Center the edge with the ends of the flap lined up with the side seams of the bag. Note: The strap ends will be covering the seams so the ends of the flap will actually line up with the center of the strap. Baste the flap to the top edge of the bag. Insert the right-side-out quilted case inside the wrong-side-out lining. Line up the top edges and pin. Sew around the pinned edge using a 1/2-inch seam allowance. Trim the seam to 1/8-inch. Turn the case right side out through the opening in the bottom of the lining. Hand sew the opening in the lining closed. Press the top edge of the case. Lift the handles, strap, and flap out of the way and top stitch around the opening 1/4 inch from the edge. Hand sew a 5/8-inch flat button to the center of each flower on the pockets. Do not sew the pockets closed. This case was designed to fit a laptop with 9 1/2-inch by 14 1/2-inch dimensions. If your laptop is larger or substantially smaller than these dimensions you will need to adjust the size of a few pattern pieces. After measuring your laptop, add or subtract the difference to the body, pockets, flap, the length of the collar and all matching linings. You will not need to change the size of the handles, strap or the flowers. The Stitching Scientist has an easy laptop case tutorial that borders slightly on intermediate with the addition of a zipper. The zipper is well worth the effort. For something a little more unisex, Sew Mama Sew has a quick and easy pattern for a laptop sleeve. Slide your laptop into the case, slip in a notebook and other accessories, and tuck in the flap. You are ready to work or surf anywhere!